in each person’s heart, blocking the past and choking off the future. these lovely, lying children, I saw very clearly that there was no redemption here. Suki Kim’s book Without You, There is No Us is one of the most powerful and moving accounts of another culture that I’ve read in a long time. During the summer and fall of 2011, Kim, born in Seoul and now a New York writer, taught English at Pyongyang University of Science and Technology (PUST) in North Korea. As incredible as it may seem, PUST, where the sons of North Korea’s elite are schooled, is financed and staffed by Christian missionaries. They are forbidden to proselytize, but nonetheless believe that by “showing the love of Christ and being kind” to these future leaders, they would plant the seeds for their eventual conversion. As Kim explains: “North Korea was the evangelical Christian Holy Grail, the hardest place to crack in the whole world, and converting its people would guarantee the missionaries a spot in heaven.” The teachers were allowed to have their own private religious services, and when they did pray in public they had to keep their eyes open. Just as the Christian God makes all things possible, so, too, did Kim’s students believe that “if they got a good grade, it was thanks to the Great Leader Kim Jong-Il’s solicitude. If their English improved, that also had to do with his solicitude.” When singing hymns with her fellow teachers, she observed that “if you replaced the word ‘Jesus’ with ‘Great Leader,’ the content was not so different from some of the North Korean songs” her students sang. It is not completely accurate to describe North Korea as an atheistic state. 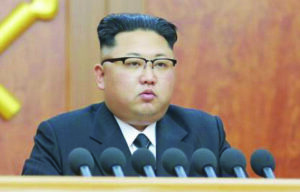 Christian Caryl describes it as a “theocracy” with “a mixture of Stalinism, ethnic nationalism, a version of Confucianism, and Korean folk shamanism.” Former North Korean leaders Kim Il-Sung and Kim Jong-Il, who died just as Ms. Kim left the country, have been deified, many miracles have been attributed to them, and people are required to bow at their statues. It is even a crime to deface or even sit on a picture of these demi-gods. Every night a contingent of Kim’s students would guard the Kimilsungism Study Hall where they studied North Korean political ideology every afternoon. While the evangelical teachers had their daily prayer meetings, the students also went to church and guarded “the spirit of their Great Leader” every night. Suki Kim mentions two meanings of “without you, there is no us.” The first is that Koreans cannot recover their true identity as a people without a peace treaty and the unification of their divided country. Over the years, some family visits have been allowed, but most Koreans do not know what happened to family members after the war. North Korean officials make this process nearly impossible by removing people from their home towns. The ancient clan system, which provided social cohesion through large extended families, has been abolished. With the exception of some South Vietnamese who chose to flee, the remaining Vietnamese have now pulled off an amazing economic success story as a united country. At great cost, former West and East Germans have now come together as the most prosperous nation in Europe and the world’s third largest economy. Germans in the East are still catching up economically, but North Koreans are still twenty times less wealthy and live on average 11 fewer years. Kim’s students expressed genuine love for their parents and teachers. One day, Kim asked her students to write a letter on any topic. Most of them wrote to their mothers, about how they missed them and how they kept their pictures nearby for consolation. One of their fondest memories was helping their mothers make kimchee. Kim found them to be ideal students: “They shouted out each answer together, hung on my every word, and demanded more homework. I had never been revered so absolutely.” There was never a dull moment during her office hours, when all of her students came, always with a “buddy” who was assigned to each of them. Kim was especially surprised to experience her students’ intellectual curiosity. They engaged Kim in a long discussion about whether animals could be creative. Kim believed that they could, but most her students argued the contrary. A revealing moment was when one student admitted that at least one member of the class agreed with her. Kim was convinced that her students’ sincerity was not false, and that they truly loved their dear “professor.” They cried when she left after their summer session together, and they desperately wanted her to come back in the fall. Most of the students’ false statements were not, strictly speaking, lies, but misinformation spread by the government. They maintained that their universities were the best in the world. They also believed that everyone in the world spoke Korean, and that kimchee, the most popular food in the world, was made the official food of the 1996 Olympics. Kim’s students believed that they won the war, and that they could crush South Korea and the U. S. any time they wished to. (They must now be exceedingly proud of their military’s successful testing of a long-range missile.) Their hatred for Americans and South Koreans was not only deep, but it was expressed in vulgar and obscene ways. (Kim observed that Korean north of the 38th Parallel had become “a language of curses.”) Fortunate for her, Kim found that she was exempt from these vile denunciations. Her students even liked her South Korean accent. It is significant that none of Kim’s students mentioned The Great Leader in the open topic letters she assigned. Miraculously, they were liberated for just a brief time. One of them wrote: “I am so glad at this chance to write down what is on my mind.” Kim was surprised that one student had the courage to write that he was “fed up” with the PUST routine. But then on December 17, 2011, the Great Leader died. The second meaning of “without you, there is no us” now captured their minds with full force. Years of brainwashing convinced them that without Kim Jong-Il, they could not be. These young men who missed their mothers and loved their teachers were now nothing but shadows, something very much like the wraiths of the Greek Hades or the Hebrew Sheol. The next morning Kim was in the dining room eating her last breakfast on campus. Her students refused to sit with her or even meet her eyes, and they looked as if the “life had been sucked out of them. I no longer existed for them in this world without their Great Leader.” In stark contrast to the departure after summer session, this time there were no tears and no good byes. North Korea is one of the last hold-outs of the Cold War, an ideological battle between Western individualism and Communist collectivism. Most people have found the latter not only economically destructive but also morally corrosive, and North Korea is the most dramatic example of the multiple failures of Communism. We in the West have not fully examined the fundamental problems with our own excessive focus on the individual, which has led, arguably, to many of our society’s ills. When pondering this issue, I always like to turn to the wisdom of Martin Buber for guidance. In his classic book I and Thou he writes: “There is no I as such but only the I of the basic word I-Thou. I require a Thou to become; becoming I, I say Thou.” For Buber, too many of us interact with others on an “I-It” basis. Therefore, Buber offers us the full and fundamental meaning of “without you, there is no us.” The I-Thou relationship is the only place where authentic persons are found, and both individualist and collectivist ideologies can easily rob people of their very souls.